Grade 5-8 Unit, Lesson 7: Is There Anyone Out There? 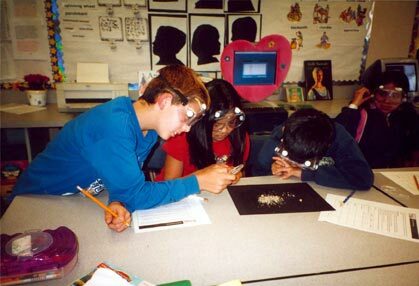 Students in a 5th grade class in San Diego conduct the Searching for Signs of Life activity found in the Voyage Grade 5-8 lesson Is there Anyone Out There? Students are presented with three soil samples representing simulated Martian Soil. After visual inspection of the soil samples they ‘feed’ the samples with nutrient solution and assess if this causes any observable activity. They then explore the nature of the observed activity and determine if it represents chemical or biological processes. The lesson is a direct analog to the life science experiments conducted by the Viking Landers on the surface of Mars in 1976. The nature of the observed activity on Mars, once soil samples were fed ‘chicken soup’, allowed researchers to distinguish with high confidence between chemical and biological processes.